The National Park Service expects to spend about $25 million to move marinas and extend boat launch ramps if Lake Mead continues to shrink in the coming years, according to a new low-water plan released last week. 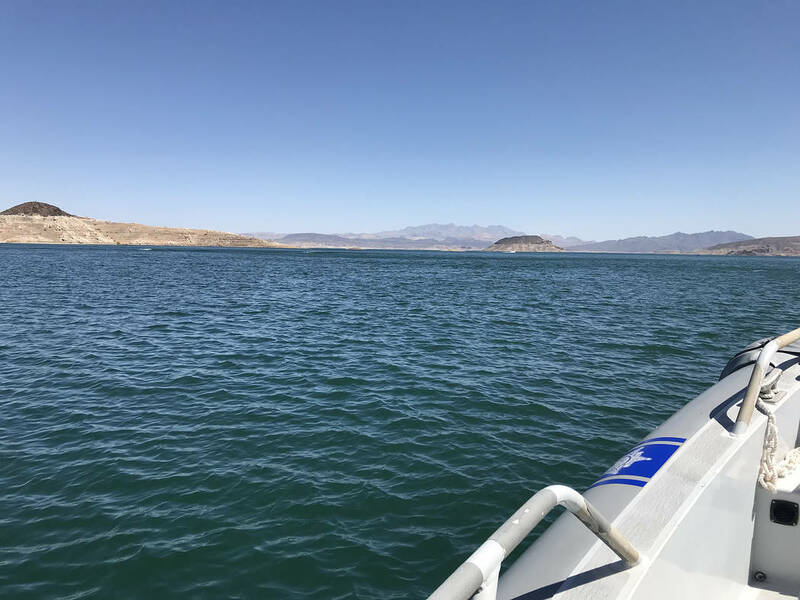 (Hali Bernstein Saylor/Boulder City Review) Lake Mead, as seen from the water in May 2018. Marina operators would pay an additional $8 million under the plan, which lays out how recreational access to the water can be maintained should the lake drop to a once-unthinkable level 125 feet lower than it is now. “We chose an extreme number. We’re really hoping that never happens, because there would be a lot more at stake than just recreation at that point,” said Christie Vanover, spokeswoman for Lake Mead National Recreation Area. The park’s current low-water plan, adopted in 2005, addresses infrastructure and access issues down to a surface elevation of 1,050 feet above sea level, roughly 28 feet lower than it is now. The new document extends those plans 100 feet, to 950 feet above sea level. The lake hasn’t been below the 1,071-foot mark since it was being filled in 1937. “It doesn’t mean it’s going to drop, but now we’ve got a plan if it does drop,” said Rod Taylor, vice president of Forever Resorts, which operates the marinas at Callville Bay and Temple Bar. The park service has spent more than $40 million since 2002 chasing the retreating shoreline of the reservoir, which has seen its surface drop by 130 feet since drought took hold on the Colorado River in 2000. Before that the lake was home to six marinas and nine launch ramps. Three marinas and six launch ramps remain in service. Vanover said the park could be forced to close two more ramps — at Boulder Harbor and South Cove — by as early as 2020, should the lake fall below 1,070 feet above sea level. Federal forecasters expect that to happen in March 2020. The new low-water plan looks at a range of alternatives, but the one preferred by park officials and marina operators would extend roads, utility lines and other infrastructure needed to maintain the three marinas and four remaining launch ramps. It also leaves open the possibility of restoring the marina at Echo Bay, which closed in 2013 because of low water. The park service is accepting input on the plan through Dec. 31. Public meetings on the plan have been set for Dec. 10 in Kingman, Arizona, and Dec. 11 in Henderson. “Despite the fact that it’s about 38 percent full, it’s still one of the largest (man-made) lakes in America,” she said. It’s also among the most popular, with almost 8 million annual visitors, sixth most among National Park Service sites. Callville Bay Marina faces the biggest challenge under the new plan. As the shoreline recedes, that facility could be forced to push out into open water or shift to neighboring Swallow Bay, which is about 2½ miles away by water. That would require the construction of almost a mile of road. Gripentog Kaiser said she might be forced to push her marina operation farther to the southeast in Hemenway Harbor, but the new plan won’t require a change as radical as the one the family-owned business faced in the early days of the drought in 2002. Las Vegas Bay, at the western edge of the lake, basically dried up that year, forcing Gripentog Kaiser and company to move their entire operation about 13 miles across the lake to where it is today. “We were the first to get zapped,” she said. “There was no plan” back then. That’s why marina operators welcome the park’s new planning effort, even as they worry about the perception problems it may cause. Taylor said there’s always a “fear factor” associated with any bleak report about the water level in Lake Mead. But it’s still massive, he said. The plan is available for review online at http://parkplanning.nps.gov. Comments may be submitted via the website or mailed to Lake Mead National Recreation Area, Compliance Office, 601 Nevada Way, Boulder City, Nevada 89005. Comments must be received by Dec. 31.